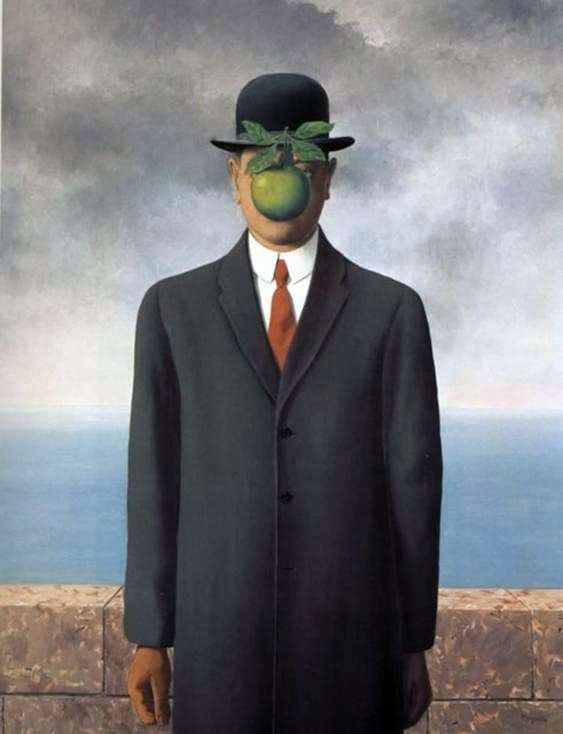 The most famous among the works of Rene Magritte is the enigmatic picture “Son of Man.” Written in 1964, she immediately captured the minds of external simplicity and extreme depth of content. An eye catching and easy-to-remember image of a man in business attire – a black coat on a shirt with a tie, and with a bowler hat on his head. A paradoxical object – a green apple blocks the face of a person. Most often, the picture is interpreted as a symbolic image of a modern man – a businessman, who nevertheless remains a descendant of the first man – Adam, and therefore subject to temptations and sinful actions; they, like the apple of knowledge, overlap the world view of existing visible and invisible things. However, Magritte, most likely, would like to give the right to interpret his canvas to each of us individually. After all, it is: everyone who looks at the “Son of Man” reveals his vision of life, his personal philosophy. Magritte’s works are not just bright beautiful posters, in addition they carry a philosophical mystery. To show the existence of a hidden meaning, the hidden essence of phenomena in the world – this is the task of the surrealist Rene. And the artist himself refused to identify himself with this direction. Surrealism was based on psychoanalytic science. The images of Magritte are not scientific, but more mystical, and they do not imply dry intellectual debate, but the flight of creative fantasy and the search for the truth of being. “Son of man” is a stranger who has lost his individuality, who is looking at what is hidden from his eyes. The background – the wall, the sea and the sky in the clouds – nothing distracts his attention. Interestingly, the canvas was written as a self-portrait. Now the appearance of an anonymous Mr. in a bowler hat and jacket is sometimes perceived separately from the author of the picture. “The Son of Man” has successfully entered into modern popular culture and continues to inspire people to ask questions that are far from everyday fuss.